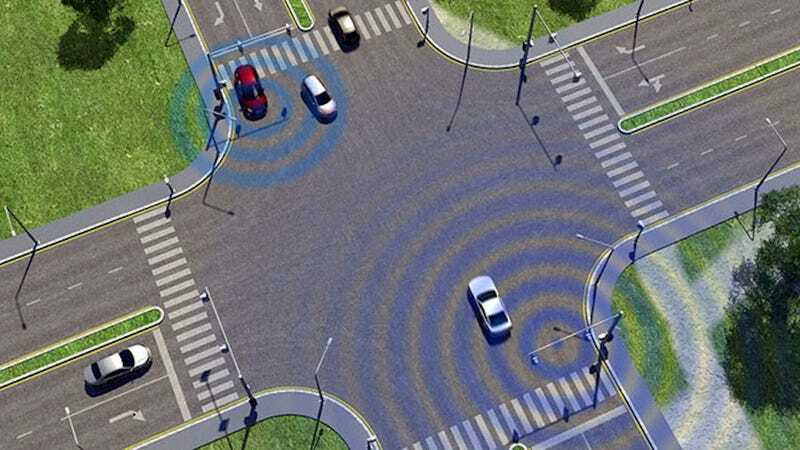 The U.S. Department of Transportation brought us one step closer to that utopian future where cars never crash on Monday with the announcement that it will move ahead with vehicle-to-vehicle communication (V2V) technology. In short, the government wants all the cars on the road to talk to one another. It makes perfect sense, especially where safety's concerned. So much so that Transportation Secretary Anthony Foxx actually compared V2V communication to well-established life-savers like seat belts and air bags—and, in the coming months and years, his department will begin taking the appropriate steps to make this technology just as ubiquitous. It's unclear so far, however, what the immediate next steps will be. The process is actually already underway. In August 2012, the DOT launched the Safety Pilot "model deployment" in Ann Arbor, Michigan, where some 3,000 vehicles were equipped with V2V communication technology. As National Highway Traffic Safety Administration (NHTSA) Administrator David Strickland said at the time, "Vehicle-to-vehicle communication has the potential to be the ultimate game-changer in roadway safety—but we need to understand how to apply the technology in an effective way in the real world." Final results from the study are expected later this year.